Everyone loves a great story. When that hook grabs you, it pulls you in and straps you down to a roller coaster of ups, downs, and everything in between until you finally come full circle into a wonderful sense of satisfaction and accomplishment. Today, I'm thrilled to say is both the climax and the resolution for one of my favorite stories, "Schoology Rubrics: The Next Generation." This final installment completes our rubrics overhaul, and even though we're never done improving any aspect of our platform, it represents a big milestone for us and the rest of the Schoology Community. 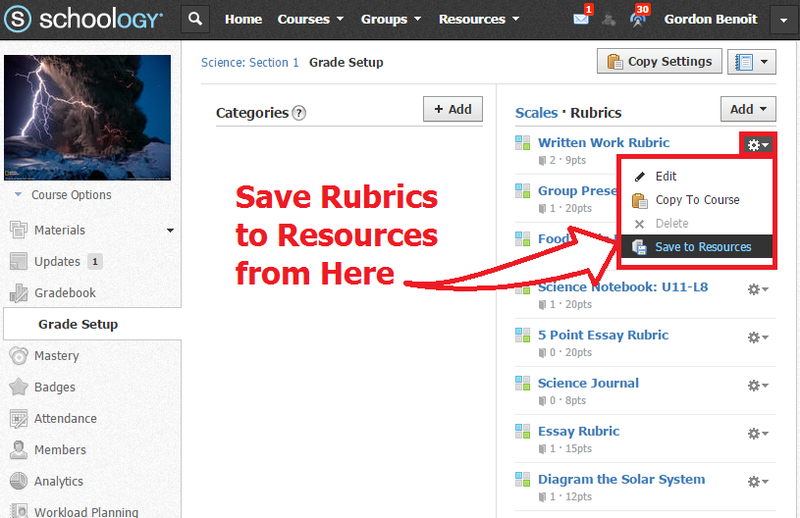 Just as many of you requested, rubrics are now fully portable throughout the Schoology platform. That means you can save them to your resources, share them with colleagues, and create standalone rubrics that can be easily disseminated across your institutions. Pair all of this with the rubrics enhancements we released February 20 allowing you to save, copy, and customize them within courses, and your entire rubric workflow is completely simplified. You can now add rubrics to your resources in a couple different ways. The first is via your course Grade Setup area. This makes it easy to take the rubrics you've already spent time designing and keep a master copy handy for later use. The second method for saving rubrics is by creating them from within your resources area. It's so much easier to manage all your rubrics when the master copies live in the same place as opposed to in individual courses. How's that for awesome? In the last rubric update, we showed you how rubrics stay attached to instructional materials when they're copied from one course to another. We've gone ahead and made them even stickier so they stay with their materials wherever they go! Take an assignment, for example. Whether you're saving an assignment from a course to your resources or vice versa, if there's a rubric attached, it will stay attached.That means you can keep reusing the same resources from year to year without ever having to choose how they're graded or choose rubric criteria! In fact, when adding a rubric-aligned resource to a course, that rubric will automatically be incorporated into your course's rubric list so it's readily available if you want to use it again. Many of you have wanted to share your rubrics with others across the hall and around the world, and we're happy to oblige, especially in the name of collaboration. So share rubrics with individuals (a collection at a time), share them with groups, and even share them with the public! *The Share button shares the entire resource collection—not a single resource—with individuals of your choosing. That just about wraps this up. As I said, we're never really done, but this feels like a resolution to this story. I'm sure its sequel is right around the corner! So go see what these rubric enhancements are all about (you can learn the nitty-gritty details in our help articles) and let us know what you think. Feel free to speak your mind here on the blog, via the Twitterverse (@Schoology), or any other channel you'd prefer. Also, if you have any questions, our Support Team is ready. Beyond Compliance: What if the IEP Is Not Enough?